Estou definitivamente numa fase decorativa cada vez direccionada para uma mistura de estilos entre o boémio, o étnico e alguns toques escandinavos, que adoro e não podem faltar. 1. Começa por imprimir as imagens escolhidas em papel seda. Encontrei estas imagens de elefantes indianos no Pinterest e achei-as perfeitas. Para imprimir no papel seda, a técnica é semelhante à que usei para fazer o vaso mexicano numa das minhas colaborações com o blog Doce Para o Meu doce e que podes ver aqui . 2. Corta as imagens impressas na medida das bases para copos e aplica o Mod Podge. Primeiro passa uma camada fina de Mod Podge na base. De seguida, sem deixar secar, coloca o quadrado de papel seda cuidadosamente e com a ajuda do pincel ainda húmido de Mod Podge. Tenta que não enrugue demasiado. Se ficar com alguns vincos, sem stress. Faz parte!!! 3. Deixa secar as bases e começa por rasgar em diferentes tamanhos os pedaços de papel seda coloridos. Aplica os pedaços de papel seda colorido tal como no passo anterior. Dispõe a gosto. 4. Depois de bem seco, passa uma camada final de Mod Podge, para selar a peça. - Se não encontrares Mod Podge, podes usar esta receita caseira. I'm definitely in a new decorative fase , that involves a mixture of styles between bohemian, ethnic and some scandinavian touches that I love and can not miss. In an imaginary that calls for trips to hot and colorfull destinations, I tried to do some coasters that reflected this mood. 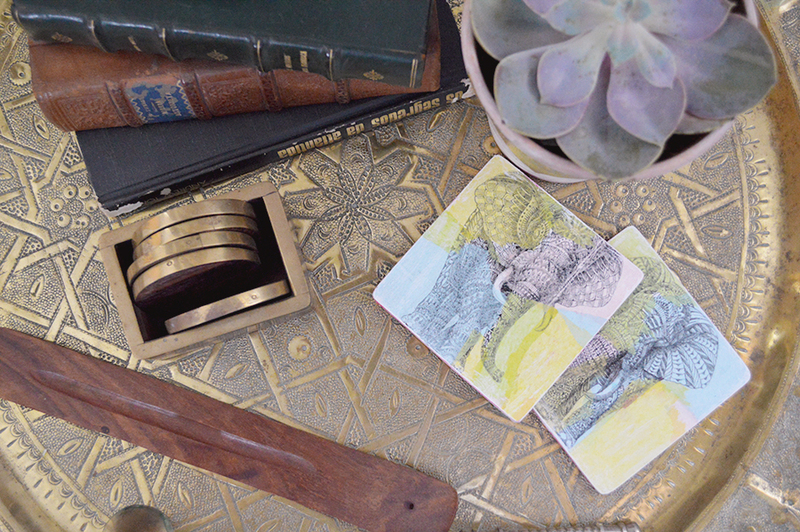 After finding this wonderful Moroccan table, this Indian elephants made perfect sense. 1. 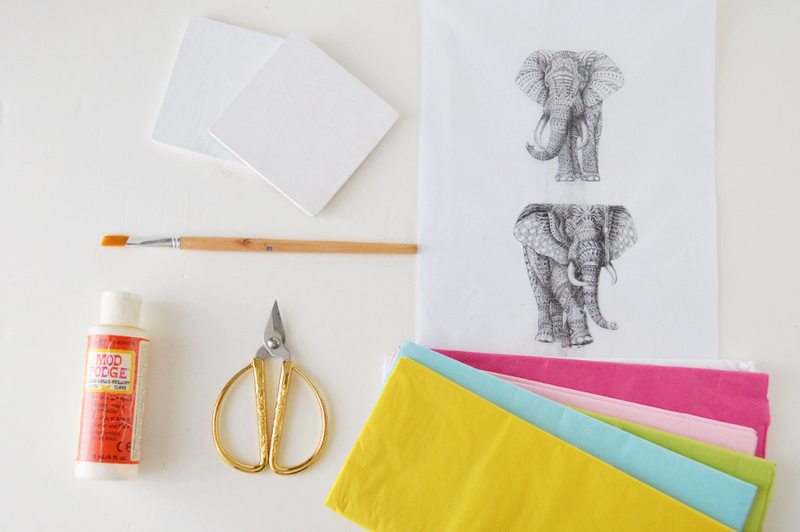 Start by printing the chosen images in tissue paper. 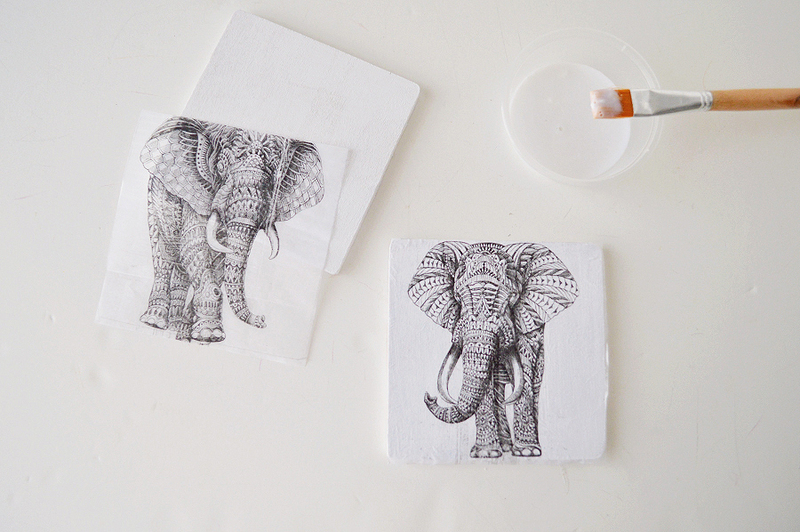 Found these Indian elephants on Pinterest and they where perfect. To print on silk paper, the technique is similar to that used to make the Mexican pot in one of my collaborations with the blog Sweet For My Sweet and you can see here. 2. 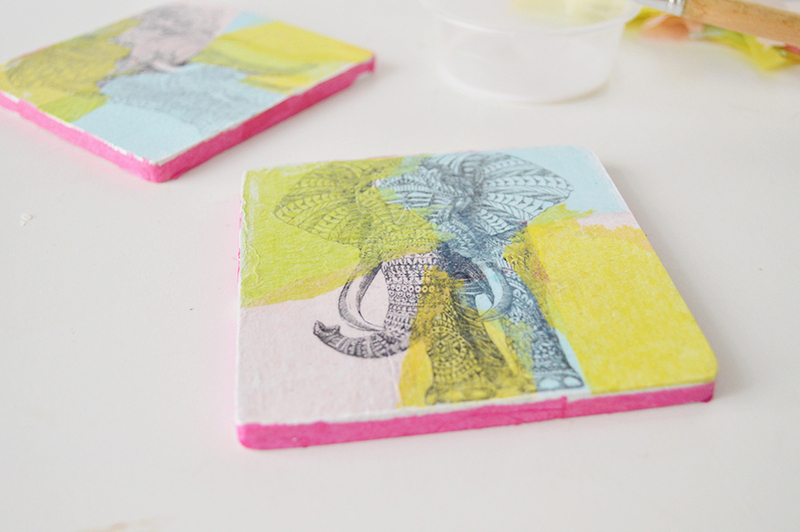 Cut the printed images according to coasters size and applie the Mod Podge. First pass a thin layer of Mod Podge to the coaster base. Then, without letting it dry, put the squared tissue paper carefully and use the brush, still wet with the Mod Podge, to help setting the image. Try not wrinkle too much. If you have some creases, no problem. It's part of the handmade process !!! 3. 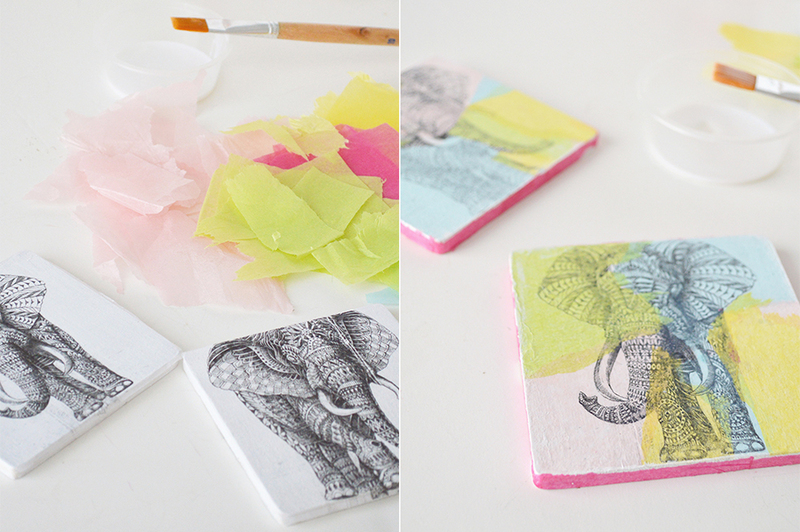 Let coasters dry and begins by tearing the colored tissue paper into different size pieces. Apply the colored tissue paper pieces, using the same process in the previous step. 4. After properly dried, go througth with a final layer of Mod Podge to seal the piece. - If you do not find Mod Podge, you can use this homemade recipe.